A super dear friend of mine donated a few hand knitted items to my son's school's year-end auction fundraiser (that's a mouthful). One of the items was a super cute Daphne and Delilah the Momma and Baby Monster stuffies set, which the Kiddo promptly fell in love with (along with the Star Wars Stormtrooper baby blanket that she had knitted up. You can view the photo of these items on my Instagram here). The Kiddo honestly couldn't get over just how cute and tiny Delilah was, and loved the idea that she fits perfectly in the pocket of the mommy monster. In fact, the Kiddo loved the stuffies so much that he actually asked if I could knit him a set!! The Kiddo rarely asks me to knit him anything! Shocked, surprised, so many emotions flowed over me. My heart almost exploded when he started to go through a pile of yarn that I had by the coffee table, trying to pick out colours that he thought each stuffie should be. Before I got too excited over his request though, I had to make sure that he truly wanted these before I cast on anything. So I showed the Kiddo all the knitted toys Rebecca Danger has on her Ravelry designer page (and hoping he doesn't change him mind for something way more time consuming or elaborate!!) and he was quite persistent that no other monster would do. He definitely had his heart on Daphne and Delilah. Anyhoo...I had cast on Daphne and managed to get her knitted up within a few days. I'm sure if my hands were feeling better I'd be able to get her done faster. Not that it would have made a difference since it has been days since the knitting has been finished and I have yet to sew her together (which, admittedly, I'm sort of dreading). And it took me a while to find my stash of safety eyes. As it stands today, I still haven't sewn Daphne together. I know eventually I'm going to have to bite the bullet and just do it. But for now I'm going to procrastinate for as long as I can. After all, I still have the babies to knit up (and then sew...but baby steps here...baby steps...). I had cast on the legs for the first baby and started knitting them together, but then frogged back to separate them when I realized that I didn't want two different coloured legs. The Kiddo loved the idea that the baby looked like it was wearing "pants" on the original set so I thought I would try for that look too. I'm in no hurry to get the babies done anyways because I discovered that I didn't have any smallish safety eyes within my stash and had to order some online. Not to mention that my hands are currently not loving the idea of knitting with tiny yarn on tiny needles. So far this project has been an enjoyable knit. It's quite a bit more fiddly than I'm used to in a knit but I take solace in knowing that all these ends will get hidden away inside the stuffie. The pattern itself is pretty straight forward but I did do a few mods and plan to make another on the babies. On the mommy monster I had cast on the legs using the typical (and called for in the pattern) long tail cast-on and joined in the round. I wasn't loving how the ends looked and how there was still a small little hole, regardless of how tight I pulled on the yarn to get it to close. I ended up having to go in there and sew them closed with the tail. So for the arms I tried out the Pinhole cast-on (tutorial by Tin Can Knits here) and loved the outcome. I think it will be my new go-to cast on method for anything closed and in the round. I also changed how the stitches were picked up for the pocket on the mommy. 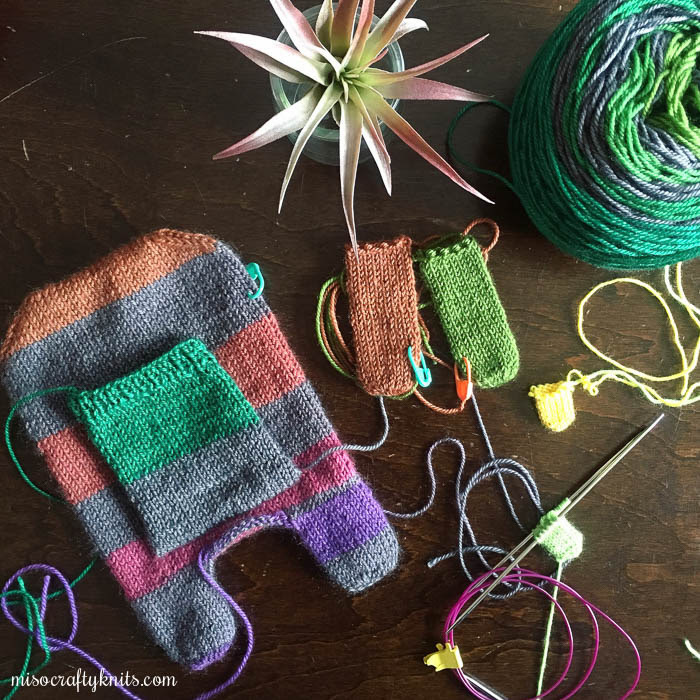 Instead of going through a leg of a stitch in a row of stitches, I opted to pick up and knit from between the stitches (like in this tutorial by Ysolda). Honestly, there's no right or wrong way to do this, I just prefer the look of going between the stitches. The one thing that I absolutely didn't like: the decreases on the head. The first time around, I didn't even notice and had bound off all the stitches. When I flipped the monster inside out I saw how wonky and gaping the decreases looked. I thought I could jimmy the stitches closer together by tugging at the stitches and evening them out. Yeah, didn't work. I got so annoyed by them that I ended up ripping out the 3-needle bind-off and frogging the decreases. I was super careful with how I was knitting the decreases but no matter what I did there was still a gapping hole. Grrr...I got to a point where I just decided to say "screw it!" and bound off the stitches again. 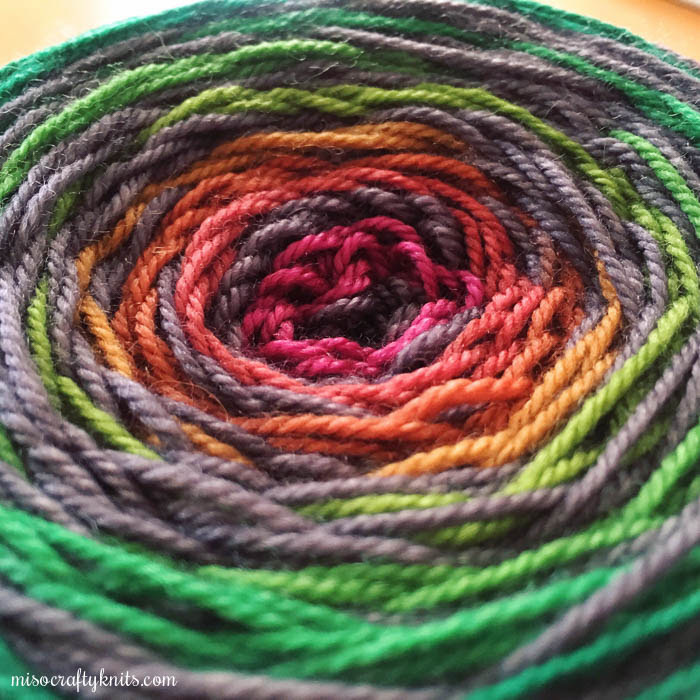 I went onto Ravelry to see if anyone else had issues with the head decreases and discovered that I wasn't alone. It wasn't me, it was the nature of the stitches and how they were placed. A lot of knitters opted to knit a stitch between the two sets of decreases to eliminate the gap. Duly noted. I will try this with the babies. So cute! What's going on with the clip on the coiled cable of your needle? Is this a cable management technique that I need to know about? This will be an adorable set. I Love that pattern. Those monsters are adorable, how sweet that you had a request!